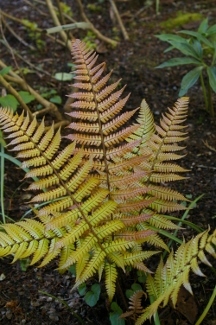 Joy Creek Photo Archive (c) all rights reserved As the common name Autumn fern indicates, the cool weather brings out autumnal highlights in Dryopteris erythrosora, a very versatile deciduous fern. The spring growth is also colorful, the emerging foliage having coppery pink tones. Try this with dark leafed Heuchera and mid-sized gold leafed Hosta for a stunning effect. Needs evenly moist conditions. A Great Plant Picks selection.